Watch live on BBC TV, Red Button, online and on mobile devices. Daily live text on BBC Sport website. 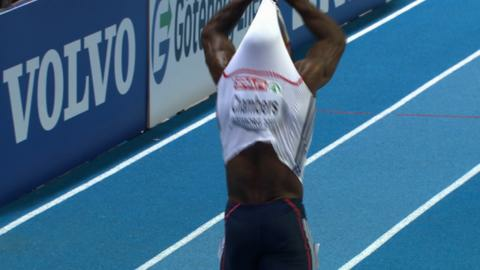 Britain's Dwain Chambers reacted furiously after going out in the heats of the 60m at the European Indoor Championships in Gothenburg. The 34-year-old ran 6.78 seconds to finish fifth in his heat, with only the top four progressing. Chambers angrily threw his vest to the floor as he headed through the media zone without stopping. He ran 6.58 seconds earlier this season but missed the British trials as he struggled with a back problem. Fellow Britons Harry Aikines-Aryeetey and James Dasaolu progressed with times of 6.65 and 6.62 respectively. There was another surprise exit as Michael Rimmer, the fastest man in the world this year, failed to make it through the 800m heats with a third-place finish in 1:51.04. "I felt pretty good. Obviously, getting used to hitting the bends quicker than you usually do [is difficult]," Rimmer told BBC Sport. "It's a steep learning curve. I'll have to go back to the drawing board." Mukhtar Mohammed (1:49.43) and Joe Thomas (1:51.11) made it through to the 800m semi-finals, as did team captain and defending champion Jenny Meadows in the women's event after finishing third in her heat with a time of 2:02.88. "I think I'm better in a faster pace [race] so I'm really looking forward to the pace stepping up," said the 31-year-old, who was racing for only the second time in 18 months following an Achilles injury. "Dwain is an athlete at the end of the day and these things hurt. The frustrations kick in. He's free to be himself and is expressing what any athlete would do if they came to the championships and didn't perform well. He knew he didn't do enough and it would be wrong for him to be smiling about it. That's not the Dwain I know." "I've been doing a lot of training on my own. It's really good to learn how to respond, people do bump into you. If I don't go off in a fast pace in the first 200m, I lose the best bit about me." Nineteen-year-old Scot Laura Muir made it into the 1500m final with a personal best 4:12.36, and said: "I didn't know if I was going to make the final and I am so, so chuffed. I gave it everything in the last 50m. "I have not done many events with a heat and final so I might be tired tomorrow, but it has been pretty amazing being in the team." Olympic bronze medallist Robbie Grabarz narrowly avoided joining the list of early departures as he made it through to the high jump final despite three failures at 2.28m. "I've just found out I've made the final and I was surprised," he told BBC Sport. "It's a great track to jump on and I just ran too fast. It's all good. The jumps I did jump I cleared by a huge distance. I've just got to realise I don't have to try hard to clear heights like that. That's as close as it comes to messing it right up." Earlier in the day, Britain's Perri Shakes-Drayton impressed with the fastest qualifying time of 51.50 in the 400m heats, and compatriots Eilidh Child and Shana Cox also reached the semis. All three British men - Nigel Levine (46.68), Michael Bingham (46.92) and Richard Strachan (46.96) - advanced to the semi-finals as Britain looks set to challenge across the board in the 400m events. Shara Proctor qualified for the long jump final with her first attempt of 6.61m, Yamile Aldama went through with 13.92m in the triple jump. Holly Bleasdale cleared 4.56m to reach the pole vault final, despite accidentally spraying perfume in her eyes before competing. "That was really silly. I went to spray it on my neck and it went in my eyes, but I saw the doc and washed them out," said Bleasdale. "They felt great, and it seemed to work so maybe I should do it tomorrow as well. "I was really nervous coming into it, I handled it pretty well. I'm really happy. I couldn't have asked for much more." The four finals on day one saw Russia's Sergey Shubenkov win the men's 60m hurdles, Turkey's Nevin Yanit took gold in the women's event, France's Ida Antoinette Nana Djimou retained her pentathlon title ,and Serbian Asmir Kolasinac won the men's shot put.